We had a successful garage sale and watched football with friends. A good time was had by all! On Sunday night we took a short trip off the beaten path to try out a restaurant I’ve been hearing good things about for years. Papa Boudreaux. Cajun. Papa’s is located about 25 minutes southwest of Franklin in the community of Santa Fe. Now I know that those of you who live in Nashville are thinking that it isn’t worth the trip because you would have to drive nearly an hour to get there. However, you would be wrong. This place is just plain crazy and it’s also crazy good. Jeanine is the head chef at this establishment and she greeted us with a very warm welcome. She cooks everything from scratch and is extremely enthusiastic about her job. She also waited on us. Did I mention this place is small? Probably seats less than 40 people but I have heard they have outdoor seating too when the weather is nice. There is a Papa. He is the owner and he was there during our visit. He is just as entertaining as everything else. Now let’s go ahead and get something straight right now. Papa’s is not fancy. At. All. But they know Cajun food. 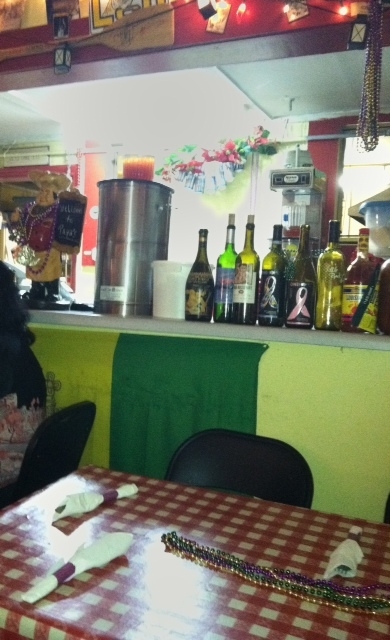 They have cinder block walls and the place is decorated with Louisiana garb and Mardi Gras beads. The tablecloths are white and red checkered with lobsters. I’m not even kidding. But it works. It was a really fun change of pace and you really appreciated the food they serve. It’s BYOB, which I love and diners literally bring in their whole cooler. Anything goes people. 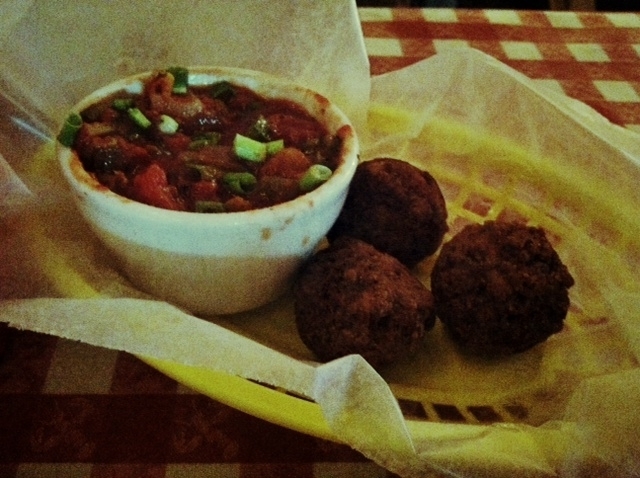 We started out with Boudin (Boo-Dan) Balls. Affectionately called into the kitchen as “an order of balls”. If you have never had Boudin it is pork and rice sausage and in this case it is deep fried. Don’t Google it. Just eat it. They also serve the most delicious bread with plain butter. But it is so good you don’t even need the butter. Fresh and hot out of the oven. Next up was Crawfish Etouffee. This was everyone’s favorite dish. Creamy and garlicky, it was on top of a bed of rice in perfect proportion. I keep discovering that I really like Crawfish which I wouldn’t expect from myself but what can I say, I like surprises. I should also mention the portion sizes are very generous but not in a way that they lacked quality ingredients. They have lot’s to choose from. Their menu is written on a single chalk board and includes: gumbo, Red fish and Shrimp Creole, just to name a few. For dessert three people split their Chocolate Bread Pudding. We debated whether or not to get dessert because we were all so full and we devoured it. Guess we weren’t so full after all! They don’t take credit cards. Only cash or check. 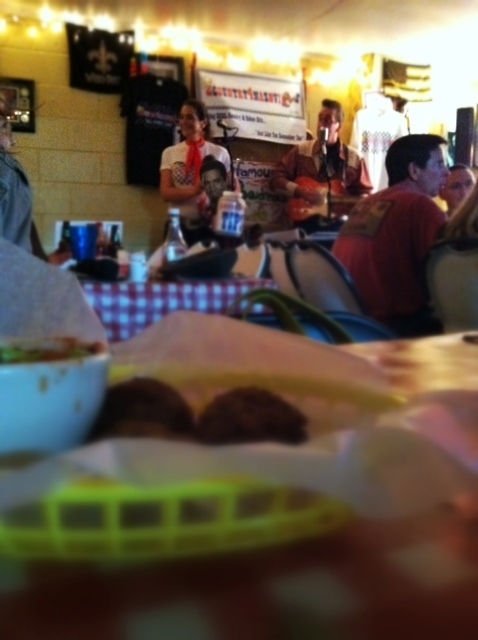 While we were there we had the pleasure of hearing the two man band and real life couple 2 Country 4 Nashville. Admittedly, I don’t gravitate toward Country music but these guys are playing the old stuff, which I dig. Waylon Jennings, Elvis, Johnny Cash and more. They are great entertainers too. They have lots of shows at tasty restaurants around the middle Tennessee area and sometimes they have a full band too, so be sure and check them out! You won’t find a nicer duo. WHAT’S YOUR FAVORITE LOCAL DIVE? That place is delicious! 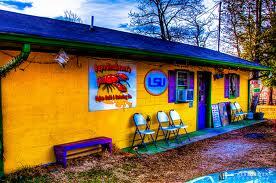 I had the crawfish etouffee too — word on the street is this place has the most authentic cajun food in Tenneessee. I can believe that. That ” place is delicious”, is a understatement ! Oops, ! I am from Papa’s home country of N’awalin’s ( that’s New Orleans for you foreigners ). After relocating to the Nashville area some years ago, the only Cajun food available was an occasional trip down south. Of course, there have been more than several Cajun restaurants that have since, come and gone; not even close to what is authentic in Cajun and Creole lines of cooking. A friend suggested that i try Papa Boudreaux’s Cajun Cafe as we began hearing all the “Hoopha” stories in conversation at lunch time all around the office. So, after several punches in the ribs about my needing to try this place, a couple of friends and our wives set out for Papa’s one weekend. Upon arrival, you need to find a parking space as there are cars, large trucks and even Limo’s (there could be a professional entertainers tour bus too ) all over the parking lot. People standing around waiting to be seated. Those who have experienced the occasional 1 – 2 hour wait, brought their lawn chairs, coolers of beer and wine and what’s so cool, will always offer to share their beverages with first-timers ! The wait is intense, that is, until someone (and it’s usually Papa in a very loud voice) comes out and screams out your name to be seated. NOW, it’s time to eat. The menu’s on a large chalk-board. on the left side is the basic menu: Gumbo, Red Beans, rice and sausages ( I say “sausages” as papa uses several kinds along with Cajun Tasso which is a Cajun spiced ham which is so tasty). Shrimp Creole, Chicken Creol, Chicken & Andouille Creole, Crawfish Etoufee’, Crawfish & Shrimp Etoufee’. and some more to boot. Papa has some of his own creations such as, Gospel Creole, Fish St. Jaques and others which you will find on the right side of the chalk-board, that promote “Specials’. Fresh Select Oysters, Louisiana Red Fish, Soft Shell Crabs, Boudin, Au Poive ( which is known as Cajun Bar-B-Q Shrimp) and much more. By the way, “Au Poive” in Cajun translates to ” Pepper” so be careful if your stomach is not used to HOT items… most are not but as Papa says, if you want it “Suicidal”, just ask the waiter/waitress ( Papa says, ” this is the 21st century, they are no longer waiters and waitresses; they are ” Waitron Units” as he causes everyone around him to laugh out loud at his antics and jokes … that’s papa). Papa told me after I asked him about the place, ” good food, plenty of it, good music, and most of all, laughter is what makes Papa’s work”. I agree and we come back as often as mu belly tells me, “it’s time for a real treat” ! See ya’ll at Papa’s soon ! You really know your stuff first hand! Thank you for all the added information! Jeanine, my executive chef and Herbert my training chef, both informed me about this writing. Thanx bunches for all the kind words and more so, the blog or web (whichever this is), written about the Cafe. I love it whenever people express their favor for Papa Boudreaux’s as we have in the past and will continue to strive to make our patrons, feel as if they are actually experiencing a night of New Orleans. 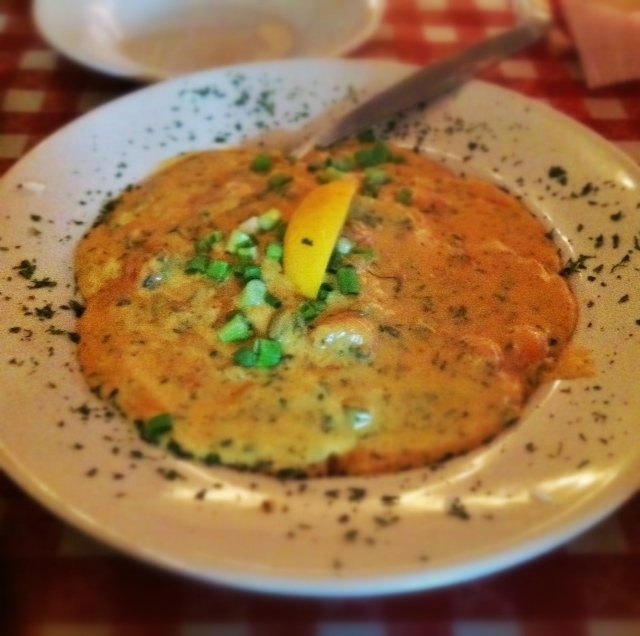 Papa Boudreaux’s Cajun Cafe & Catering Co. Thanks for the post Papa! We will be back!